Audio cables work by sending electrical signals from one place to another. This is very similar to the way that electrical current flows from a power outlet in your house. 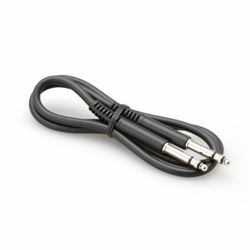 However audio cables use much smaller voltages than a common 110 volt plug. In order for electricity to flow between two points you need two things: a hot or positive wire and a neutral or negative wire. This completes a circuit and allows the electrical signal from your instrument to your amp, mixing console or computer interface. All standard audio cables use this basic electrical principle no matter what connector is attached to the end. This is what is happening when you plug your guitar into your amp with a "¼" guitar cable or when you connect your DVD player to your TV with an RCA plug, they both work exactly the same way. I have noticed online that there seems to be a lot of confusion and long explanations about the difference between balanced and unbalanced audio cables. All most guitarists and recording enthusiasts need to know is the basic electrical difference between the two and what that means for them. Iâ€™m going to try to explain the difference in plain English as best I can. Unbalanced cables work exactly as I just described. 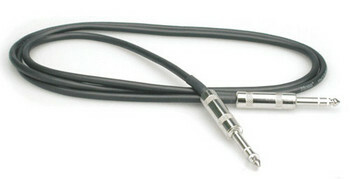 In a guitar cable for instance there is positive wire or tip which connects to the tip of the connector at the end of the cable. And a neutral sleeve that wraps around the wire connected to the tip. The neutral or sleeve serves two purposes: To provide a neutral conductor so that electricity can flow and to shield the positive middle wire from outside interference. -Low impedance audio, or mic level would be 48-52 Ohms (3-pin XLR connectors, balanced lines). -Higher (but not high) impedance audio for mixers and other distributive audio equipment instrument level is around 1,000 [between 680 to 1,800] Ohms (1/4" phone connectors, TS-unbalanced and TRS-balance lines). -High impedance audio Mixers, other circuit applications, distribution amps and other distributive audio line level require 1,000 to 10,000 Ohms (RCA connectors, unbalanced lines). Q: So my guitar cables and pedals are unbalanced? A: YES, nearly all guitar equipment is. Unbalanced cables can be prone to outside electrical interference over long distances. Basically the longer the cable, the less effective the sleeve is going to be at shielding the cable from outside electrical interference. Fortunately most guitar cables and patch cables are relatively short so this is usually not an issue for most musicians. A good rule of thumb for any unbalanced cable is if it's over 10ft long and you are using it in a room or on a stage with a lot of other electrical equipment you could hear unwanted hum, buzz, or noise. A. (2) In recording situations it's ok to use unbalanced cables in most cases but if you want crystal clear audio try to keep them under 10ft. Also, watch out for unbalanced connections on the back of rack gear. Having an unbalanced connection near that much other gear could cause noise problems. Balanced cables still rely on a hot conductor and a neutral conductor to carry electrical signals but they add another element to the equation: a ground. A ground is called a ground because well it literally goes into the ground! Straight through the cable, through your balanced audio gear, through the wall to the fuse box and down a wire or pipe into the Earth. In balanced audio cables the sleeve is used as the ground. The ground or sleeve does NOT carry a signal and is NOT heard in the audio. It's simply there to protect from unwanted noise while the hot and neutral carry the signal. Now for the magic: the hot and neutral both carry the same signal, noise and all. Hot is flowing in a positive direction, neutral in a negative direction. Balanced audio equipment simply outputs the voltage difference between the two wires. Since the noise is represented equally on both hot and neutral it is inverted and cancelled out. I know this might sound complicated but what it means for you is that you can have hundreds of feet of balanced cable and still have noise free audio. Q. What types of things use balanced audio cables? A. Microphones and recording equipment is, or should be, balanced in most cases. Q. If I use a balanced cable with my guitar can I balance the signal? A. No. The equipment you are using must have balanced connections as well. Q. Why are balanced cables so expensive? A. They are made with a process called twisted pairing which is more expensive to manufacture than unbalanced cables. Q. If I have the choice of using balanced or unbalanced cables which one should I use? unbalanced it's ok as long as the cable length is short and you get no unwanted noise. The technical name for guitar cables is TS which stands for Tip (hot), Sleeve (Neutral). Any cable that has three prongs or legs like an XLR Cable is usually balanced. Some cables are made for odd routing situations and are three legged on one side and two pronged on the other. These are still unbalanced. This is the standard ¼" cable seen on guitars and unbalanced recording equipment. A TS or mono mini plug is most commonly seen as an adapter. 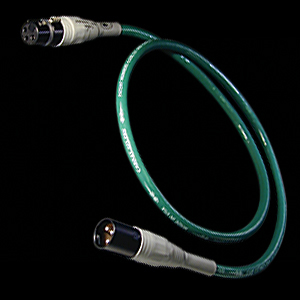 RCA connections are seen primarily on entry level recording equipment. They are also found on consumer products like DVD players, turntables, and older television sets. Banana plugs are mostly used for consumer audio speaker connections. 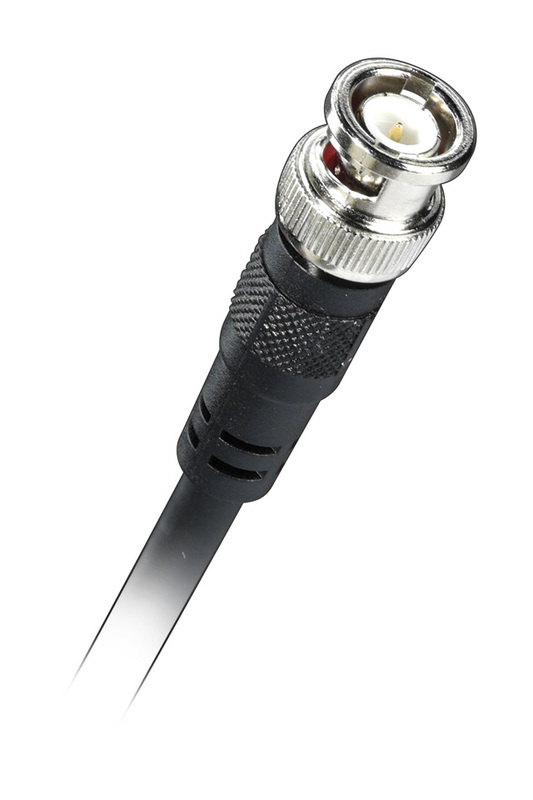 An insert cable splits a stereo signal into two mono parts and is referred to as a Y-Cable because it is literally shaped like a Y.
XLR is the most common connection for microphones and is often referred to as a mic cable. TRS is a balanced ¼" cable that is used in studios and live sound reinforcement to minimize noise over long distances. 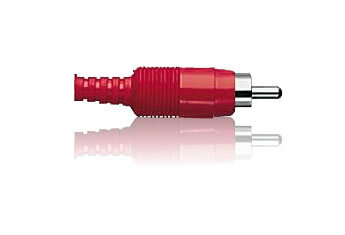 The 1/8" mini plug connector is often used on headphones and other consumer sources like sound cards. The TT or Tiny Telephone is a balanced connection used for connections in professional patch bays. Most digital connections use the same principles we have already discussed; they just use them in a different way. 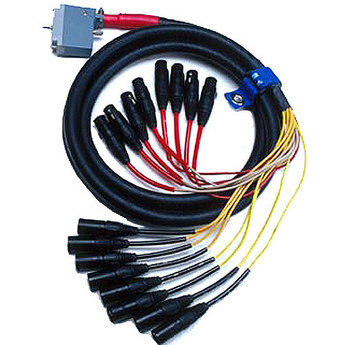 Digital cables are made to send pulses of current or light that can be decoded by a computer. It is VERY important to use the proper cable type with digital connections. Things like impedance or the amount of resistance present in the cable play an important role in how this information is sent. Just because a S/PDIF cable looks like an RCA Cable doesn't mean the RCA cable plugged into your DVD player can handle a S/PDIF connection. You might experience strange errors and digital distortion if you use a cable that is not properly rated. S/PDIF or Sony/Phillips Digital Interface is by far the most common digital connection. It uses a 75 ohm unbalanced RCA phono connection. You can use standard RCA cables if they are rated at 75ohms. Optical or Light Pipe is a discrete multichannel digital standard developed for the ADAT. It is most commonly seen on digital audio interfaces and preamps. You may also see optical ports on high end consumer devices as an audio connection. Optical cables use pulses of light to send information. They tend to be expensive and fragile so handle with care. AES/EBU: is basically S/PDIFs big brother. AES uses the same protocol as S/PDIF but it can handle more information at once. AES/EBU uses a balanced connection with XLR on both sides. 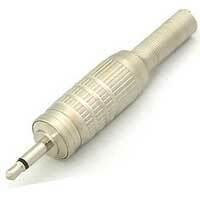 When using an XLR make sure it is Type 1 (referring to pin order) and rated at 110 ohms. BNC is an unbalanced connection that is used primarily in professional video as an alternative to RCA. On the audio side of things it is mainly used to carry word clock information. 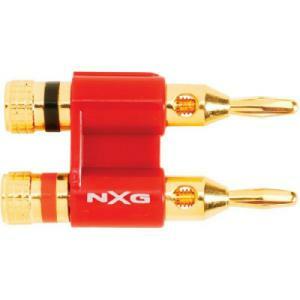 BNC comes in 50 and 75 Ohm varieties, most audio equipment uses 75 ohm. Multi-pin connectors are usually found on high end audio interfaces and consoles, they are used as a balanced multi channel connection that saves space on the back of a piece of gear. Each pin on the connector is a discrete channel that carries audio or digital information from one point to another. Most guitarists and home recording enthusiasts won't run into these connections too often because they are mainly used in recording or live sound equipment that is very expensive. 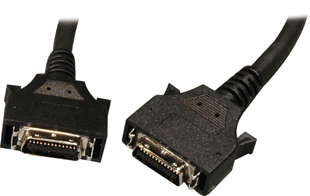 D-Sub is a family of connectors used on computer devices and comes in multiple pin configurations. 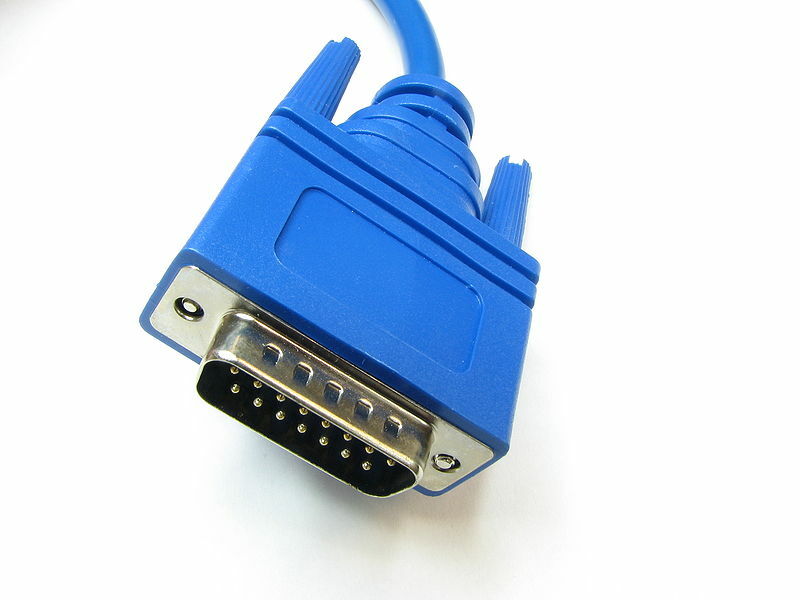 The most common D-Sub connection is the one found on the back of VGA computer monitors. It is not uncommon for companies to use D-Sub to carry audio on high end peripherals because the connectors are common and relatively inexpensive. Elco and Edac (which in many cases are interchangeable) are large multi pin connectors that can have as many 120 pins. They can be heavy and have an actuating screw that holds the male and female connectors in place. A proprietary type of 25 pin D-Sub that was created by Tascam. It is found on a wide variety of professional recording equipment as an alternative to the ADAT standard. Audiokabel versenden ein elektrisches Signal von einem Punkt zum anderen. Dies ist dem normalen Stromfluss wie aus der Steckdose Zuhause sehr Ã¤hnlich. Audiokabel benutzen jedoch sehr viel kleinere Spannungen als die Normale 230 Volt Steckdosen-Spannung. Damit ElektrizitÃ¤t zwischen zwei Punkten flieÃŸen kann, braucht es zwei Dinge, einmal eine positive Leitung und eine neutrale Leitung. Wenn man beide hat kann nun ein elektrischer Kreis entstehen, der ein Signal vom Instrument an Ihren VerstÃ¤rker, Ihren Mixer oder den Computer weiterleitet. Alle standart Audiokabel benutzen dieses Grundprinzip der Elektrik egal welcher Anschluss an das Ende angeschlossen ist. Dies geschieht, wenn Sie z.B. Ihre Gitarre an Ihren VerstÃ¤rker mit einem 6.35mm Kabel anschlieÃŸen oder wenn Sie Ihren DVD Player anhand eines RCA Steckers mit Ihrem Fernseher verbinden. Beide funktionieren genau auf diese Weise. Im Netz entstehen oft Verwirrung und ewige ErklÃ¤rungen was das Thema symmetrisch und asymmetrisch angeht. Alles was Gitaristen und Aufnahme-Enthusiasten kennen mÃ¼ssen ist der grundlegende Unterschied zwischen beiden und was das bedeutet. Asymmetrische Kabel funktionieren genu so, wie bisher beschrieben. Im Gittarenkabel (6.35mm â€“ Â¼") gibt es somit die positive Leitung, die Spitze und die neutrale Leitung, den Schaft, der sich um die Leitung legt, die an die Spitze angeschlossen ist. Das Neutrale dient hier zwei verschiedenen Zwecken: Erstens dient es als neutrale Leitung um einen Stromfluss erst mÃ¶glich zu machen und zweitens schÃ¼tzt es die positive, mittlere Leitung vor auÃŸenliegenden Interferenzen. Audio hÃ¶herer Impedanz (aber nicht hoch), fÃ¼r Mixer und andere verteilende AudiogerÃ¤te. Der Instrument-Pegel ist hier ca. 1000 Î© (genauer: zwischen 680 und 1800 Î©). Audio hoher Impedanz fÃ¼r Mixer, Schaltkreise, verteilende VerstÃ¤rker oder andere verteilende AudiogerÃ¤te. Line-Pegel benÃ¶tigt 1000 bis 10000 Î©. Also sind meine Gitarren Kabel und Pedale asymmetrisch? Ja, fast jedes Gitarren Equipment ist asymetrisch. Asymmetrische Kabel sind anfÃ¤llig fÃ¼r Interferenzen von AuÃŸen Ã¼ber lange Distanzen. Im Grunde, desdo lÃ¤nger das Kabel, desdo weniger effektiv ist der Schaft im SchÃ¼tzen des Kabels vor elektrischen Interferenzen. Zum GlÃ¼ck sind die meisten Gitarren- und Patchkabel relativ kurz, was bedeutet, dass es hier meist kein Problem gibt. Als Faustregel gilt: Das asymmetrische Kabel sollte nicht lÃ¤nger sein als 3 Meter sein, wenn Sie es in einem Raum oder auf der BÃ¼hne benutzten mit viel elektrischem Material in der NÃ¤he. Wenn es lÃ¤nger ist kann es sein, dass UnerwÃ¼nschtes wie Brummen, Rauschen und Krach auftaucht. Was bedeutet das fÃ¼r mich? In Aufnahmesituationen ist es meist in Ordnung asymetrische Kabel zu benutzen, wenn Sie aber kristallklaren Ton haben wollen versuchen Sie die LÃ¤nge der Kabel unter 3 Metern zu halten. AuÃŸerdem sollten Sie auf asymetrische Verbindungen auf der RÃ¼ckseite des Racks achten. Wenn ein asymmetrisches Kabel in der NÃ¤he von so viel Material ist kann ein Rauschen entstehen. Symmetrische Kabel benutzen immer noch den positiven und negativen Leiter um das elektrische Signal zu tragen aber hier wird ein drittes Element hinzugefÃ¼gt: Die Masse. Die Masse geht durch das Kabel, in Ihr symmetrisches GerÃ¤t, durch die Wand, den Sicherungskasten und in den Boden. Bei symmetrischen Kabeln dient der Schaft als Masse. Die Masse trÃ¤gt KEIN Signal und kann nicht im Ton gehÃ¶rt werden. Die Masse dient einzig und allein der Abschirmung vor ungewollten GerÃ¤uschen wÃ¤hrend positiv und neutral das Signal transportieren. Welche GerÃ¤te benutzen symmetrische Audiokabel? Mikrofone und AufnahmegerÃ¤t sind, oder sollten, in den meisten FÃ¤llen symmetrisch sein. Wenn ich ein symmetrisches Kabel mit meiner Gitarre benutzen, kann ich das Signal symmetrisch machen? Nein, das GerÃ¤t muss auch immer symmetrisch sein. Warum sind symmetrische Kabel so teuer? Symmetrische Kabel werden mit einem speziellen Verfahren hergestellt, das "Twisted Pairing" oder auch "Aderverdrillung".Dieses Verfahren ist teurer als die normale Herstellung wie bei asymmetrischen Kabeln. Wenn ich die Wahl habe symmetrische oder asymmetrische Kabel zu benutzen, welche benutze ich dann? In den meisten FÃ¤llen sollten Sie bei symmetrischen GerÃ¤ten auch symmetrische Kabel benutzen. Wenn Sie aber mal unbedingt ein asymmetrisches Kabel benutzen mÃ¼ssen, ist das in Ordnung sofern es nicht zu lang ist und Sie kein unerwÃ¼nschtes Krachen bekommen. Wie kann ich ein symmetrisches von einem asymmetrischen Kabel unterscheiden? Der technische Name fÃ¼r Gitarrenkabel ist TS, was fÃ¼r Tip (= Spitze), das Positive und Sleeve (= Schaft), das Neutrale steht. 6.35mm (1/4") Studio Kabel werden TRS gennant, fÃ¼r Tip (= Spitze), das Positive; Ring, das Neutrale und Sleeve (= Schaft), die Masse. TS Kabel haben einen Ring auf dem Stecker. TRS Kabel haben zwei Ringe. Kabel, die drei Zinken oder Beine haben, wie ein XLR Kabel, sind meist symmetrisch. Manche Kabel werden fÃ¼r sehr spezielle Routing Situationen hergestellt und haben drei Beine an einem Stecker und zwei am anderen. Diese sind immer noch asymmetrisch. Dies ist ein standart 6.35mm Kabel wie bei Gitarren und anderen asymmetrischen AufnahmegerÃ¤ten. Solch ein TS oder Mono Mini Stecker wird meist als Adapter benutzt. RCA AnschmÃ¼sse werden meist bei Einsteiger AufnahmegerÃ¤ten verbaut. AuÃŸerdem kann man diese auf VerbrauchergerÃ¤ten finden wie DVD Playern, Turntables oder alten FernsehgerÃ¤ten. BanenenanschlÃ¼sse werden meist bei Lautsprechern fÃ¼r den Endkonsumenten verbaut. Ein Insertkabel teilt ein Stereo Signal in zwei Mono Signale und werden Y-Kabel genannt, da es diese Form hat. XLR Kabel werden meist fÃ¼r Mikrofone benutzt und werden so auch oft Mikrofonkabel genannt. Das TRS ist ein symmetrisches Kabel, welches in Studios und bei Liveauftritten verwendet wird um Krachen und Rauschen Ã¼ber lange Distanzen zu minimieren. Der 3.5mm "Mini" Stecker wird meist bei KopfhÃ¶rern oder anderen Konsumentenprodukten verwendet, wie z.B. Soundkarten. Der TT Stecker wird als symmetrische Kabel fÃ¼r professionelle Patch-Panel verwendet. Die meisten digitalen AnschlÃ¼sse verwenden die gleichen Prinzipien wie die, die wir bereits behandelt haben, verwenden diese aber auf eine andere Art. Digitale Kabel senden Strom- oder Lichtimpulse, die von einem Computer entschlÃ¼sselt werden kÃ¶nnen. Bei digitalen AnschlÃ¼ssen ist es sehr wichtig das korrekte Kabel zu verwenden. Impedanz oder Resistenz spielen bei diesen Kabeln eine groÃŸe Rolle bei der DatenÃ¼bertragung. Nur weil ein S/PDIF Kabel wie ein RCA Kabel aussieht, bedeutet das nicht, dass das RCA Kabel, welches man in einen DVD Player einsteckt auch eine P/PDIF Verbindung handhaben kann. S/PDIF oder Sony/Phillips Digital Interface ist bei Weitem der gebrÃ¤uchlichste Anschluss. Es benutzt einen 75 Î©, asymmetrischen RCA Stecker. ADAT Lightpipe ist ein Audio Protokoll, welches als digitaler multikanal Standart fÃ¼r ADAT entwickelt wurde. Am hÃ¤ufigsten findet man diesen Anschluss bei digitalen Audioschnittstellen und VorverstÃ¤rkern. Diese LichtleitanschlÃ¼sse kann man manchmal auch auf hochwertigen Verbraucher-GerÃ¤ten als Audioanschluss finden. Lichtwellenkabel benutzen Lichtimpulse um Informationen zu versenden. Oftmals sind diese Kabel eher teuer und zerbrechlich und mÃ¼ssen daher mit Sorgfalt behandelt werden. AES/EBU ist eigentlich der groÃŸe Brider des S/PDIF Anschlusses. AES benutzt das selbe Protokoll wie der S/PDIF Anschluss, kann aber viel mehr Informationen gleichzeitig transportieren. AES/EBU sind symmetrisch und haben auch dementsprechende symmetrische XLR Stecker an beiden Enden. Wenn Sie ein einfaches XLR Kabel benutzen wollen brachen Sie eines des Typen 1 (in Bezug auf die Stiftordnung) bei 110 Î©. Das BNC ist ein asymmetrisches Kabel, welches vorwiegend bei professionellen Video Anwendungen als Alternative zu RCA verwendet wird. Was Audio angeht, wird es meist als TrÃ¤ger fÃ¼r Wordclock Informationen verwendet. BNC hat einmal eine 50 Î© und eine 75 Î© Variation, die meisten AudiogerÃ¤te verwenden aber die 75 Î© Variante. Mehrpolige Stecker, bzw. Multi-Pin Stecker sind meist auf High-End Audio Schnittstellen und Konsolen zu sehen. Sie werden als symmetrische Multikanal-Verbindung benutzt, die Platz auf der RÃ¼ckseite des GerÃ¤tes spart. Jeder Pin ist ein separater Kanal, der ein Audio Signal oder digitale Informationen trÃ¤gt. Die meisten Gitaristen und Aufnahmeenthusiasten werden nicht sehr oft auf diese Art Stecker stoÃŸen, da diese meist bei sehr teurem Aufnahme- und Live-Sound-GerÃ¤ten verwendet werden. Die D-Sub Steckerfamilie wird oft bei Computern benutzt und kommt in verschiedensten Pin-Konfigurationen. Der gebrÃ¤uchlichste D-Sub ist der VGA Stecker, den man auf der RÃ¼ckseite vieler Computer Monitore finden kann. Der D-Sub Stecker wird oftmals verwendet, da die Stecker sehr weit verbreitet und relativ billig herzustellen sind. Elco und Edac (die meist untereinander austauschbar sind), sind groÃŸe Multi-Pin Stecker, die bis zu 120 Pins beinhalten. Sie kÃ¶nnen sehr schwer werden und haben eine Schraube zum Einrasten, die das mÃ¤nnliche und weibliche Ende zusammenhÃ¤lt. Der TDIF Stecker ist eine Art D-Sub, aber mit 25 Pins. Er wurde von Tascam entwickelt. Dieser Anschluss wird oft auf porfessionellen AufnahmegerÃ¤ten als Alternative zum ADAT Standart verwendet. Les cÃ¢bles audio fonctionnent en envoyant des signaux Ã©lectriques d'un endroit Ã un autre. Ceci est trÃ¨s similaire Ã la faÃ§on dont le courant Ã©lectrique dans votre maison circule. Mais les cÃ¢bles audio utilisent des tensions beaucoup plus faibles que la prise 230 volt gÃ©nÃ©rale. Afin d'Ã©lectricitÃ© de circuler entre deux points, vous avez besoin de deux choses: Un fil positive et un fil neutre. Ceci achÃ¨ve un circuit et permet un signal Ã©lectrique de votre instrument Ã votre ampli, table de mixage ou ordinateur. Tous les cÃ¢bles audio standard utilisent ce principe de base en Ã©lectricitÃ© n'importe quel connecteur est fixÃ©e Ã l'extrÃ©mitÃ©. Tous ca arrivent si vous connectez votre guitare Ã un ampli avec un cÃ¢ble 6.35mm ou si vous connectez un lecteur DVD avec une TV avec une prise RCA. Les deux travaillent de la mÃªme faÃ§on. Il y en a beaucoup de confusion et explications longues concernant les diffÃ©rences entre les cÃ¢bles symÃ©trique et asymÃ©trique. La plupart des guitaristes et enthousiastes d'enregistrement doivent seulement savoir que la diffÃ©rence de base Ã©lectrique et ce que ca veut dire. Les cÃ¢bles asymÃ©triques fonctionnent exactement comme dÃ©crit ci-dessus. Dans un cÃ¢ble guitare, par exemple, il y en a un fil positif, la "pointe" et un fil neutre, le "manchon". Le neutre sert Ã deux choses: Fournir un conducteur neutre pour que l'Ã©lectricitÃ© peut circuler et de protÃ©ger le fil de milieu positif de toute interfÃ©rence extÃ©rieure. Audio d'impÃ©dance plus haute (mais pas haute) pour les tables de mixage ou autres Ã©quipement audio de distribution. Le "niveau instrument" est environ 1 000 Î© (entre 680 et 1 800). Connecteurs jack 6.35mm, lignes TS asymÃ©trique (jack 2 points) et TRS symÃ©trique (jack 3 points). Donc, mes cÃ¢bles de guitare et pÃ©dale sont asymÃ©triques? Oui, presque tout le matÃ©riel de guitare est asymÃ©trique. Les cÃ¢bles asymÃ©triques peuvent Ãªtre vulnÃ©rables pour les interfÃ©rences Ã©lectriques sur longues distances. En gÃ©nÃ©ral, si le cÃ¢ble est plus long, le manchon sera moins efficace Ã protÃ©ger le cÃ¢ble des interfÃ©rences Ã©lectriques externes. Heureusement, la plupart des cÃ¢bles de guitare et cÃ¢bles de raccordement sont normalement courtes donc ce n'est gÃ©nÃ©ralement pas un problÃ¨me pour la plupart des musiciens. RÃ¨gle gÃ©nÃ©rale: Si le cÃ¢ble est plus long que 3 mÃ¨tres, et vous l'utilisez avec beaucoup de matÃ©riel Ã©lectrique dans une chambre ou sur une scÃ¨ne, vous pouvez entendre bruits, bourdonnements ou rumeurs indÃ©sirables. Qu'est-ce que ca veut dire pour moi? Dans les situations d'enregistrement, c'est bien d'utiliser des cÃ¢bles asymÃ©triques dans la plupart des cas mais si vous voulez du son limpide, essayez d'avoir des cÃ¢bles sous 3m. Faites attentions aux connexions asymÃ©triques en arriÃ¨re du rack. Si vous avez beaucoup d'autre matÃ©riel prÃ¨s d'une connexion asymÃ©trique peut causer des problÃ¨mes de bruit. Les cÃ¢bles symÃ©triques toujours utilisent un positive et neutre pour gÃ©nÃ©rer un signal Ã©lectrique mais ils ajoutent un troisiÃ¨me Ã©lÃ©ment: la terre Ã©lectrique. La terre est appelÃ© terre parce que elle va via le cÃ¢ble et votre matÃ©riel symÃ©trique dans le mur, la boÃ®te Ã fusibles dans la terre. Pour les cÃ¢bles symÃ©triques, le manchon est utilisÃ© comme terre. La terre n'a aucun signal et ne peut pas Ãªtre entendu dans l'audio. La terre protÃ¨ge seulement des bruits indÃ©sirables. Maintenant, la magique: Le positif et le neutre transportent le mÃªme signal, tous le son et les bruitsâ€¦. Le matÃ©riel symÃ©trique uniquement sortie la diffÃ©rence de tension entre les deux. Car le bruit est reprÃ©sentÃ© Ã©galement sur les deux, il est inversÃ© et annulÃ©. Ca veut dire que vous pouvez avoir centaines de mÃ¨tres de cÃ¢ble symÃ©trique et toujours avoir du audio sans bruit. Quel matÃ©riel utilise des cÃ¢bles audio symÃ©triques? Microphones et matÃ©riel d'enregistrement sont, ou devraient Ãªtre symÃ©triques. Si j'utilise un cÃ¢ble symÃ©trique avec ma guitare, est-ce que je peux faire le signal symÃ©trique? Non, le matÃ©riel vous utilisez doit Ãªtre symÃ©trique Ã©galement. Pourquoi est-ce que les cÃ¢bles symÃ©triques sont si chers? Ces cÃ¢bles sont produits de faÃ§on "paire torsadÃ©e", ce procÃ¨s est plus cher que la production normale du cÃ¢ble asymÃ©trique. Si j'ai la possibilitÃ© d'utiliser des cÃ¢bles symÃ©triques ou asymÃ©triques, lequel dois-je utiliser? Dans la plupart des cas, si vous utilisez du matÃ©riel symÃ©trique, vous devez utiliser des cÃ¢bles symÃ©triques. Mais si vous devez une fois utiliser un cÃ¢ble asymÃ©trique, c'est bon Ã condition que le cÃ¢ble soit court et vous ne recevez pas du bruit indÃ©sirable. Comment est-ce qu'on fait la diffÃ©rence entre les cÃ¢bles symÃ©triques et asymÃ©triques? Les cÃ¢bles TS ont un anneau sur le connecteur. Les cÃ¢bles TRS ont deux anneaux. Les cÃ¢bles avec trois dents, comme un cÃ¢ble XLR sont habituellement symÃ©triques. Certains cÃ¢bles sont produits pour des situations de routage bizarres. Ils ont trois broches Ã un connecteur et deux broches sur l'autre. Ces cÃ¢bles sont asymÃ©triques. C'est le cÃ¢ble standard pour les guitares et pour le matÃ©riel asymÃ©trique d'enregistrement. Ce connecteur Mono ou TS est le plus souvent considÃ©rÃ© comme un adaptateur. Les connecteurs RCA sont vus principalement sur â€‹â€‹l'Ã©quipement d'enregistrement d'entrÃ©e de gamme. Ces connecteurs sont Ã©galement sur les produits de consommateur, comme le lecteur DVD, les plaques tournantes ou plus vieux tÃ©lÃ©visions. Les fiches banane sont principalement utilisÃ©es pour les connexions des haut-parleurs du consommateur. Le cÃ¢ble Y divise le signal stÃ©rÃ©o dans deux parties mono. Le cÃ¢ble XLR est le cÃ¢ble la plus frÃ©quente pour les microphones et est souvent dÃ©signÃ© comme un "cÃ¢ble micro". TRS est un cÃ¢ble 6.35 symÃ©trique utilisÃ© dans les studios et live pour minimiser les bruits sur longues distances. Ce connecteur est souvent utilisÃ© pour les Ã©couteurs et autres appareils du consommateur comme les cartes de son. Ce cÃ¢ble est une connexion symÃ©trique pour les patchs professionnels. La plupart de connexions digitales utilisent les mÃªmes fonctions de base que nous avons dÃ©jÃ discutÃ©s; ces connexions seulement les utilisent dans une autre maniÃ¨re. Les cÃ¢bles digitaux envoient des impulsions de courant ou lumiÃ¨re. Ce signal peut-Ãªtre dÃ©codÃ© de l'ordinateur. C'est trÃ¨s important d'utiliser le cÃ¢ble appropriÃ© pour les connexions digitales. L'impÃ©dance ou rÃ©sistance jouent un rÃ´le trÃ¨s important dans la faÃ§on dont cette information est envoyÃ©e. Juste parce qu'un cÃ¢ble S/PDIF ressemble Ã un cÃ¢ble RCA ne veut pas dire que le cÃ¢ble RCA peut traiter une connexion S/PDIF. Vous pourriez rencontrer des erreurs bizarres et de la distorsion numÃ©rique si vous utilisez un cÃ¢ble qui n'est pas correctement Ã©valuÃ©. S/PDIF ou Sony/Phillips Digital Interface est le cÃ¢ble le plus commun pour les connexions digitales. Ce cÃ¢ble utilise une connexion RCA Phono de 75 Î©. ADAT Lightpipe est une norme digitale dÃ©veloppÃ© pour ADAT. Ils sont vu plus communs sur les interfaces audio digitales et sur prÃ©amplificateurs. Parfois, vous le pouvez trouver sur des appareils haut de gamme des consommateurs comme connexion audio. Ces cÃ¢bles utilisent des impulsions de lumiÃ¨re pour envoyer des informations. Ces cÃ¢bles ont tendance Ã Ãªtre cher et fragile, donc: Manipuler avec prÃ©caution. CÃ¢bles AES/EBU utilisent le mÃªme protocole comme le cÃ¢ble S/PDIF mais sais transporter plus d'informations en mÃªme temps. AES/EBU a des connecteurs symÃ©triques XLR. 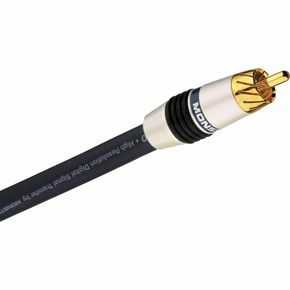 Si vous voulez utiliser un cÃ¢ble XLR, veuillez vous assurer que c'est un Type 1 Ã 110 Î©. BNC est une connexion asymÃ©trique utilisÃ©e principalement en vidÃ©o professionnel comme alternative pour RCA. Pour audio, ce cÃ¢ble est habituellement utilisÃ© pour transporter des informations Wordclock. BNC est 50 Î© ou 75 Î© mais la plupart du matÃ©riel audio utilise la version 75 Î©. Connecteurs multibroches se trouvent gÃ©nÃ©ralement sur les interfaces audio haut de gamme et sur consoles, ils sont utilisÃ©s come connexion multicanal symÃ©trique qui Ã©conomise de l'espace sur le dos d'une piÃ¨ce d'Ã©quipement. Chaque broche est un canal sÃ©parÃ© qui transporte des informations audio ou numÃ©rique d'un point Ã un autre. La plupart des guitaristes et enthousiastes d'enregistrement ne trouvent ces connexions trÃ¨s souvent. Ces connexions sont principalement utilisÃ©es dans les Ã©quipements d'enregistrement ou de son live qui est trÃ¨s cher. D-Sub est une famille des connecteurs utilisÃ©s pour les ordinateurs et est disponible dans multiples configurations des broches. La connexion la plus frÃ©quent est laquelle trouvÃ© sur le dos des moniteurs VGA. Ces connecteurs sont trÃ¨s rÃ©pandu pour transporter des signaux audio parce qu'ils sont commun est bon marchÃ©. Elco et Edac sont des connecteurs multibroches larges qui peuvent avoir jusqu'Ã 120 broches. Ces connecteurs peuvent Ãªtre trÃ¨s lourds et ont une vis pour attachÃ© mÃ¢le et femelle. Un type de D-Sub 25 broches qui ont Ã©tÃ© crÃ©Ã© par Tascam. Ce connecteur se trouve sur une grande variÃ©tÃ© de matÃ©riel d'enregistrement professionnel en tant qu'alternative Ã la norme ADAT.